The journey of the Indian sub-continent to India, Pakistan and Bangladesh has been long and painful. 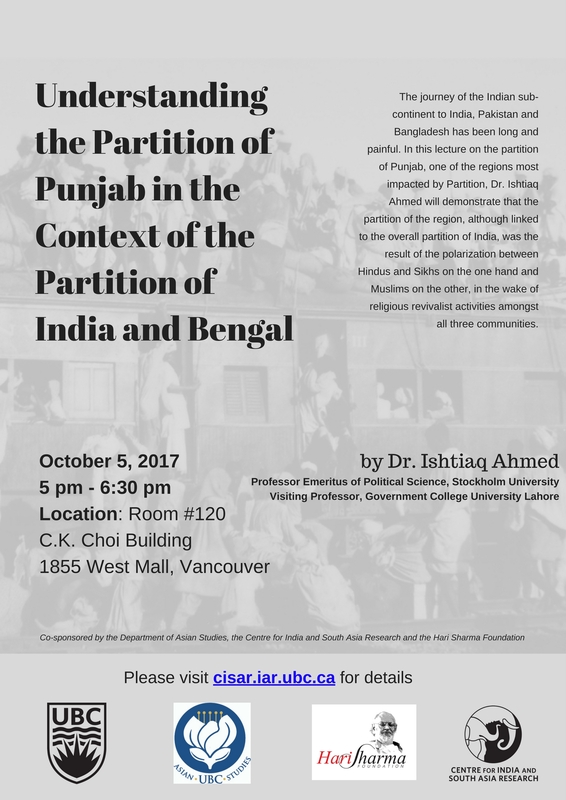 In this lecture on the partition of Punjab- one of the most affected region of the Partition, Dr. Ishtiaq Ahmed will demonstrate that the partition of the Punjab, although linked to the overall partition of India, was the result of the polarization between Hindu-Sikhs on the one hand and Muslims on the other because in the wake of religious revivals amongst all three communities. Dr. Ishtiaq Ahmed is a Professor Emeritus of Political Science, Stockholm University, Visiting Professor Government College University, Lahore and, Honorary Senior Fellow, Institute of South Asian Studies, National University of Singapore. His latest publications include: Pakistan: The Garrison State, Origins, Evolution, Consequences (1947-2011), 2013 and The Punjab Bloodied, Partitioned and Cleansed, 2012. The Punjab Bloodied, Partitioned and Cleansed won the Best Non-Fiction Book Prize at the 2013 Karachi Literature Festival and the 2013 UBL-Jang Groups, Best Non-Fiction Book Prize at Lahore and the Best Book on Punjab Award from Punjabi Parchar at the Vaisakhi Mela in Lahore, 2016. The event is co-sponsored by the Department of Asian Studies at University of British Columbia and the Dr. Hari Sharma Foundation. View PDF version of the poster here.